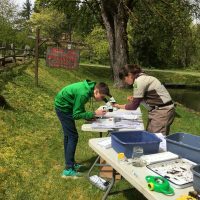 Erika Coyer is the Youth Education Coordinator at the Middle Fork Willamette Watershed Council. 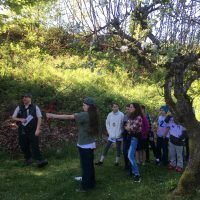 As part of this role she helps coordinate the annual Outdoor School in Oakridge, Oregon as well as facilitating the Watershed Ranger and Stewards programs. 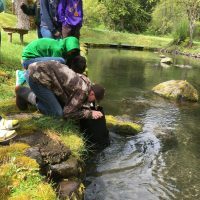 As an elementary school rite of passage for over 20 years now, Oakridge 6th graders have attended Outdoor School at the Willamette Hatchery in Oakridge. 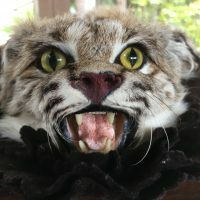 More recently, the program has expanded to include our 6th grade neighbors in Lowell as well. 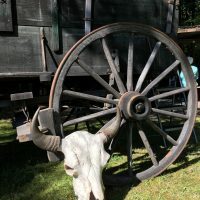 The program includes 3 days and two nights at the hatchery, where students take classes during the day, eat shared meals, and spend the night in rustic cabins. 6th graders aren’t the only students at Outdoor School. Over a dozen high school seniors from Oakridge and Lowell serve as volunteer counselors for the three-day experience. They attend classes, eat meals, and supervise cabins with their assigned 6th graders. 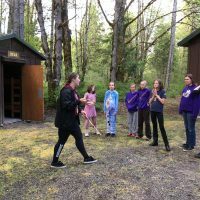 Many of them attended the same Outdoor School program when they were in 6th grade, and look forward to the opportunity to give back as counselors. Things got busy for hatchery staff, counselors, and program coordinators on May 2nd at 9am. 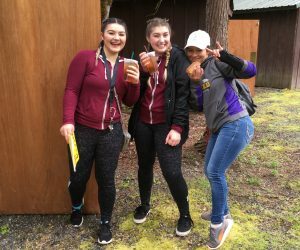 Three large yellow buses pulled into the normally quiet hatchery, and began to unload 75 students wearing traditional “wood cookie” name tags around their necks. Giant bedrolls and duffel bags poured out from under the bus as the students unloaded their gear, met their counselors, and prepared for a three-day experience they wouldn’t soon forget. 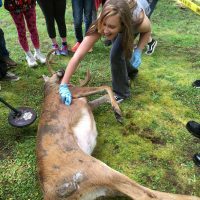 With a focus on science and natural history, classes included Nature Art, Air Quality, Hunting Law, Hatchery Practices, Salmon life cycle and Macro-invertebrate Sampling, Leave No Trace, Pollinators, Ornithology, Salmon Dissection, Oregon Trail Life, Fire Ecology, Native Heritage, Geocaching, and Service Learning. 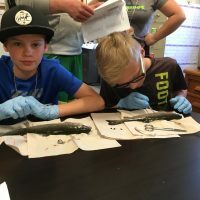 Classes were taught by agency partners from Oregon Department of Fish and Wildlife, US Forest Service, Oregon State Police, and Lane Regional Air Pollution Authority. During the first evening, gathered around the campfire, students were treated to a traditional Cherokee-style drumming performance and flint-knapping demo with OHS teacher Jason Lipe. The drumming was followed by a Pow Wow dance where all the students walked in a spiral and shook hands with every other student three times. On the second evening, local pioneer expert Wade Skinner spoke about the importance of creating a community network, setting goals and working towards achieving them, and making the world a better place through living a good life. 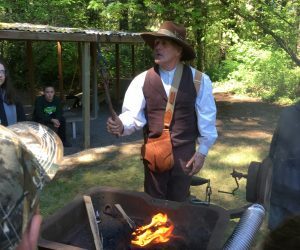 During his day class and evening presentation, Mr. Skinner showed students how to shape metal with real blacksmithing tools and forge, his authentic covered wagon, and animal skin blankets, clothing, and metal cooking tools he had made himself. The amount of work that goes on behind the scenes to provide this experience for our local students is impressive. Hatchery staff go above and beyond, planning the logistics of the program and setting up the site. Hardworking folks form the USFS fire crew set up a giant meal tent, prepared food, and served three-meals/ day to the students. 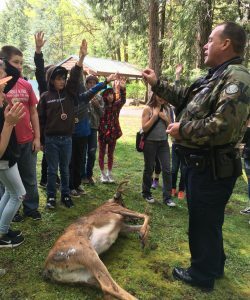 Between planning, set up, and instruction, folks from the USFS Middle Fork Ranger District and ODFW do the bulk of the work free of charge to the schools and the students. 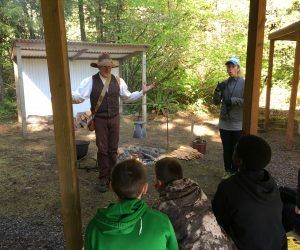 This year, for the first time, the State of Oregon began to fund Outdoor School programs, and Oakridge School District was able to collaborate with Erika Coyer, Education Coordinator for the Middle Fork Willamette Watershed Council, to help coordinate and implement the program. The funding from the state will allow Outdoor School to expand and evolve to be even better than it has been for over 20 years. This long-standing program is an incredible asset to our local education program, benefiting students, teachers, and local professionals alike. 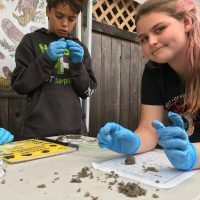 Students are exposed to place-based, hands-on science and natural history lessons taught by experts in their field. They build relationships with youth from another community, as well as deepen relationships with their own classmates. 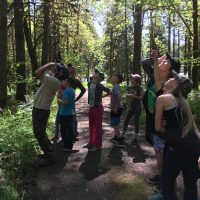 Being outside of their comfort zone gives students the opportunity to see their friends, their community, and the natural world from a new perspective. 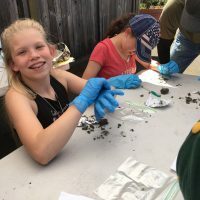 Teachers appreciate the high level of coordination and planning done on behalf of their students to provide a memorable learning experience that aligns with their educational objectives. 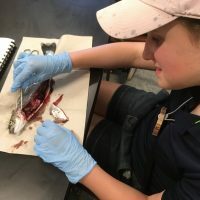 Instructors from local agencies enjoy the opportunity to share their skills and passion with an eager young audience, knowing some of these very students may explore similar career pathways based on the memorable experiences they had at Outdoor School.